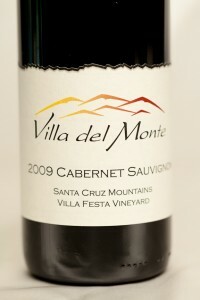 Los Gatos, CA — June 7, 2011: Villa del Monte Winery is pleased to announce that the 2011 Los Angeles International Wine and Spirits Competition has awarded a Silver medal to our 2009 Cabernet Sauvignon Santa Cruz Mountains Villa Festa Vineyard. Nearly 3200 wines from 16 countries were entered into this prestigious competition which was held from May 18 to 20 at Fairplex in Pomona, CA. Villa del Monte Winery is an award-winning, family-owned, artisanal winery in the picturesque Santa Cruz Mountains above Los Gatos, California. We produce extraordinary wines that reflect the terroir of their vineyards. We produce Chardonnay, Pinot Noir, Merlot, Cabernet, Syrah, and Syrah Rosé. Winemakers John Overstreet and Neil Perrelli work with several well-known local growers to select the best grapes possible each year for our single-varietal, single-vineyard wines. Our small lots allow us to meticulously control quality, nurturing our wines to perfection at every step in the process. Grapes come from top Northern California appellations, primarily from American Viticultural Areas (AVAs) in the Santa Cruz Mountains (Santa Cruz County) and Los Carneros (Napa County). Wine is aged in oak barrels in our forest-protected winery building, cooled by the Santa Cruz Mountains morning fog.